Vascular surgeon Dr. Yevgeniy Rits at DMC Harper Hospital is the first physician in Michigan to perform a new, non-surgical endovascular procedure for patients with chronic kidney disease undergoing dialysis. Efficient access to the bloodstream is critical for dialysis treatment and the new procedure allows vascular surgeons to create a dialysis access by connecting an artery and a vein using a minimally invasive technique developed by WavelinQ called endovascular AVF or endoAVF. Rits, assistant professor of surgery and director of the Dialysis Access Center at DMC Harper University Hospital, says the Becton Dickson WavelinQ system is an innovative new device that makes this method for creating vascular access for dialysis possible. The procedure involves inserting two magnetic catheters into an adjacent vein and artery in the patient’s forearm. The system is then activated to create a minimally invasive connection, or fistula, that can be used for dialysis treatment. The system was recently approved by the Food and Drug Administration. 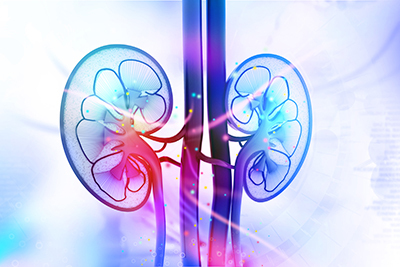 Chronic kidney disease affects millions of people world-wide. The final stage of kidney disease is called end-stage renal disease. There are 440,000 patients in the U.S alone with ESRD. When a patient has ESRD, their kidneys can no longer keep up with the body’s need to remove extra waste and water. In fact, once kidney function goes below 10-15 percent of normal function, dialysis treatments or a kidney transplant are necessary to sustain life. ESRD patients require dialysis to stay alive because their kidney function is too low to remove the necessary fluid and toxins. Clinicians rely on access to the bloodstream in order to administer dialysis, and most commonly, this is done by creating an arteriovenous fistula between an artery and vein. That type of fistula is typically placed in a patient’s arm.